We've been enjoying our neighbors' chickens while they are away for a few weeks. 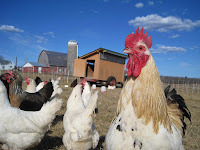 They have a portable chicken coop so when their departure date neared they just hitched the coop up to their pickup truck and drove it the 10 miles to our place. 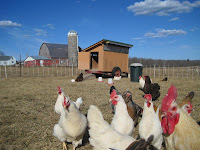 Our own hens had been taking a vacation from egg laying while they went through their moult. So we've been enjoying the sudden egg bonanza while their flock has been enjoying our pastures. This beautiful rooster is a hatchling from eggs they incubated from their own hens last summer. You wouldn't guess this is his 1st year on the job from the no-nonsense way he watches over his flock. 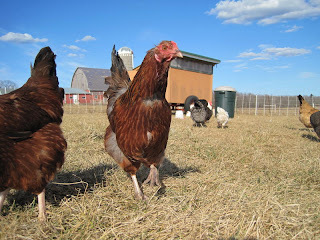 He shows up in nearly every picture I took of the hens, doing his best to make sure they are safe from my predatory photo shoot. Though it could be that he just knows what a handsome guy he is. Either way the pictures end up looking like pages of a Where's Waldo book. I hear he still needs a name. Perhaps Waldo will do?